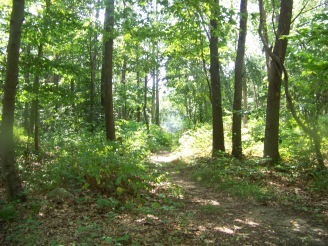 Holbrook, is included in the North West Sector of the south shore hiking trails. The towns of the North West sector of the south shore hiking trails are some of the highest trafficked towns of the south shore. A big consideration when making the trip to hike these trails!! Traffic in each of these towns is quite heavy at rush hour. do not let that one factor make you count these trails out! Many of the trails offered in these towns are in areas well established with good parking. Others, are in a bit of development and are a bit more challenging for parking convenience, but still well worth the endeavor. First considered to be settled and occupied in 1634. Like most New England towns Indians were the first settlers and here namely the Cochato Indians, as a visit to the area will verify. Many land marks are named after these peoples one being the Cochato River. The area wasn't settled by the British till 1710. Its first incorporation was in 1640 as part of the town of Braintree. Many towns of the south shore area started as one town and eventually separated and became their own town. In 1793 Holbrook and Randolph separated from Braintree and at that time Holbrook was known as East Randolph. Then on leap year day of 1872 the "village" of East Randolph separated again and formed it's current name. The town's name was taken from the Deacon of the Old East Randolph church whose son Elisha provided the money to build the newly formed town's library and town hall. In those days farming, the trades and in particular the shoe industry (as in many of the communities of the south shore)were at that time the driving force behind the economy. These seem to be the only trails in the town, yet there is plenty of land in the town for future possibilities. The biggest challenge to these hiking trails is finding a place to park. The Long trail and the Wiggin trail start off Pine st. At best there is parking for one or two vehicles at the side of Pine st.
All other trails are side trails to either these two main trails. Near the Wiggin trail entrance is Forest st. a side street directly off Pine st. The 1st right on Forest is Park Drive. Being only a short distance from the trail head and the best parking found, follow to the end of this street. Parking just in front of the Sodergren-McKay entrance which can accommodate 2-3 cars. Hiking in this forest is mostly an easy walk. There are quite a few areas that even after several dry days there remains plenty of water making some areas difficult. Good boots with solid traction and water proofing will make your journey pleasant. My start of exploring this forest was in late fall. Wet leaves can add to the slippery experience. All the more reason for good footing. I found all the hiking trails well marked. The two main trails the easiest to navigate. Some of the lesser trails had blow downs from the crazy weather we had in the past few years. Parts of the Boundary trail got very faint so the markings were well needed. Hiking these trails in late fall when all the leaves are down can pose a problem. The forest can look like one big room and the trail markings are needed to keep you on track. Can you find the trail?? the foliage will properly define a hiking trail and markings are not as important. 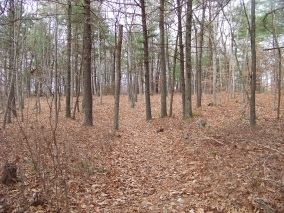 The main trail of the holbrook town forest. Long trail and Elfin trail intersect this trail. 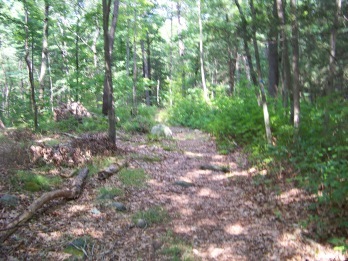 It is the most direct trail leading to the Cranberry Pond Conservation. 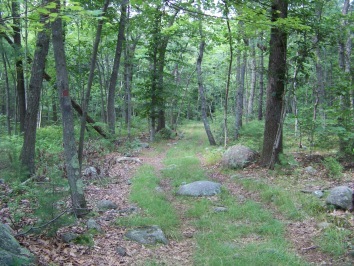 The second main trail of the Holbrook Town Forest. This trail starts as a wide open trail, but after it's intersection with the Wiggins trail is becomes narrow. This is the longest trail and brings you to most sections of the forest. 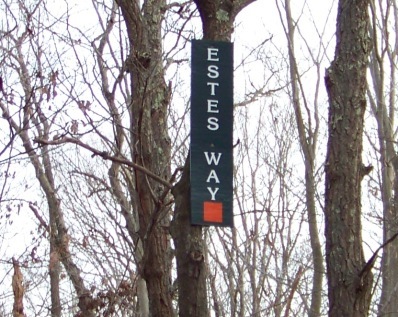 The Diman and Sawyer trails intersect this trail as well as Estes Way . There is also an unnamed connector to the Boundary trail just before Estes Way if you are following the Long trail from the trail head. 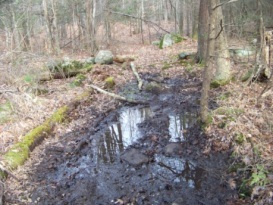 Is an interesting trail leading to a loop around Elfin Pond. This is one of the trails that can be a difficult to follow as the trail is narrow and signage becomes a bit confusing. Well worth the challenge though. This one starts at the same entrance as the Wiggins trail but splits off at the smaller power line. It is hard to follow down this line and enters the forest at a cairn on the side of the power line. 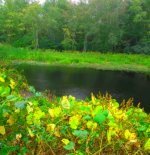 It blends into the Elfin Pond trail and follows along with it past the pond. It splits again but can be missed as the sign is positioned up the trail instead of at the intersection. A short sweet trail that goes through some wet areas. In certain times of the year the trail leads through small pools and you are left to pick your way across these. This trail is split in half by the Long trail. The trail fades away at the side heading to Wood Rd. The other end leads out to the power line. This is a very short connector path bringing you to several of the hiking trails of the town forest. The start of the Sawyer trail and the corner of the loop on the Elfin Pond trail can be accessed by this trail. It also makes it possible to access the Boundary trail.